The philosophy the Arts and Crafts style, often referred to as the 'Craftsman style', came into its own as cities grew and industry abounded. 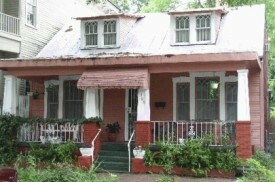 The post-Civil War era from 1865 to 1900 saw many styles of architecture crusaded for national prominence. This architectural crusade culminated in the Queen Anne style which played on the contrasts of design, material, and color and often extensive exterior decoration. As ornamentation grew to be judged as excess, and industrialization was regarded as mass producing inferior goods, a group of architects- prominently the architects William Morris, Frank Lloyd Wright, Gustav Stickley and Greene & Greene- developed a more harmonic style of architecture that encouraged simple honest design. This architectural styling became more and more concerned with the desire to express the natural elements of the surroundings and its ability to provide tranquility in the home. 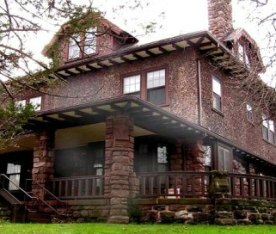 Even though a somewhat esoteric philosophy, its inspiration has produced beautiful architecture of the Arts and Crafts style that is still seen all around us. The Queen Anne, which was a less decorated Victorian, transitioned to the Shingle style which was more austere in that it attempted to blend into the environment- to be more in harmony with nature. A first step towards achieving the Arts & Crafts architectural ideal. Although the Shingle style was very popular on the northeastern seaboard in the Midwest, where winters were harsher and summers warmer, different exterior materials were needed. Thus the 'Foursquare', the 'Bungalow', and the 'Prairie style' homes were introduced. All are a part of the transition and philosophical intent of the Arts and Crafts style. The fit to the back-to-nature ideal is that the styles were adapted to the local environment. All of these styles incorporated similar interior features such as open floor plans, beamed ceilings, an abundance of woodwork and windows, stained and leaded glass, built-in cabinetry, and a fireplace. The 'American foursquares' was a simple square home constructed entirely of brick instead of shingles. These straight forward homes consisted of a two-story square frame with a very high pyramid-shaped roof. The high roof allowed a third floor. To develop the third floor space for living wide dormers with large eaves were used . On some adaptations dormers were placed on all four sides of the roof. 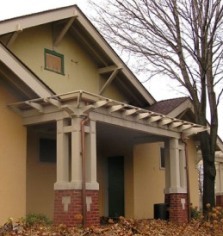 A broad front porch extending the width of the home offered summer outdoor space. 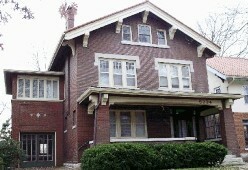 One cannot overlook the influence of bungalows -- the truest form of American Arts & Crafts architecture. As the designer and architect Gustav Stickley stated, a bungalow was a house that "never fails to harmonize with its surroundings because its low, broad proportions and absolute lack of ornamentation give it a character so natural and unaffected that it seems to blend with any landscape. It is beautiful because it is planned and built to meet simple needs in the simplest and most direct way." Bungalows that are the best representation of the Arts and Crafts style used materials such as stone and shingles. The ideal being to leave the material as close as possible to its natural state. •	Square frame, usually 2 storied. •	Usually has a front porch, which may return to a side and walkway. •	Any 0ne-story wings, porches, or carports are clearly secondary to the main house. •	Most commonly built in frame and stucco frame, but they are also found in stone or brick. • Wide overhanging eaves with exposed rafter tails. 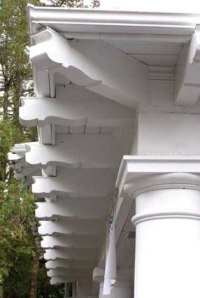 • Tapered, square porch columns. • Crafted stone or woodwork. Primarily a style distinct to Illinois, Iowa, Minnesota, and Wisconsin. The Prairie style is usually a two-story home with a very horizontal appearance. This appearance is defined by a broad hipped or gabled roof with wide overhanging eaves, a large, plain chimney, and straight walls that meet at 90-degree angles. Light-colored brick and wood was used to blend with Midwestern fields and united with the Arts and Crafts ‘natural’ philosophy. Prairie style began in 1908 and lasted 15 years. 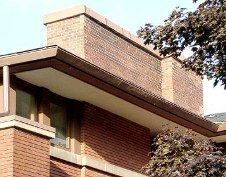 Its distinctive look earned critical acclaim for Wright and he continued its features in his designs for the rest of his life. The Arts & Crafts style era came to a close in 1918. 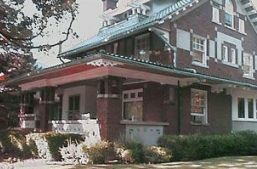 Now there is a renewed interest in Craftsman and bungalow homes, and in the Arts & Crafts tradition. •	Low-pitched roof, usually hipped. • Wide, enclosed, projecting eaves. •	Two stories, with one-story wings or porches. •	emphasis of horizontal lines, a low profile and a broad width. 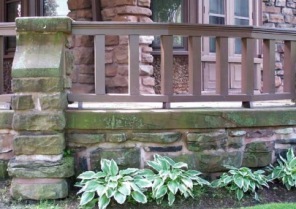 • Often massive, square porch supports. •	Bands of casement windows called 'ribbon' windows. There is some indication that the use of these windows are a expression of a Japanese influence specifically screen panels. An intresting concept. •	Large, low chimney in the center of the house.